Theoretical physicists have designed a new way to explain the how dark matter interactions can explain the observed amount of dark matter in the universe today. This elastically decoupling dark matter framework, is a hybrid of conventional and novel dark matter models. When two WIMPs find each other, they can annihilate into ordinary matter. This depletes the number of WIMPs in the universe. The universe is expanding, making it harder for WIMPs to find each other. 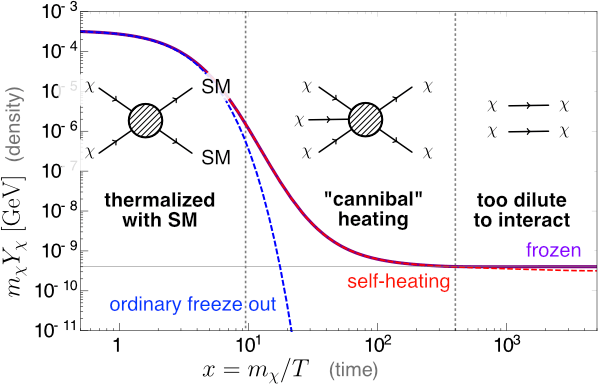 This process of “thermal freeze out” leads to an abundance of WIMPs controlled by the dark matter mass and interaction strength. 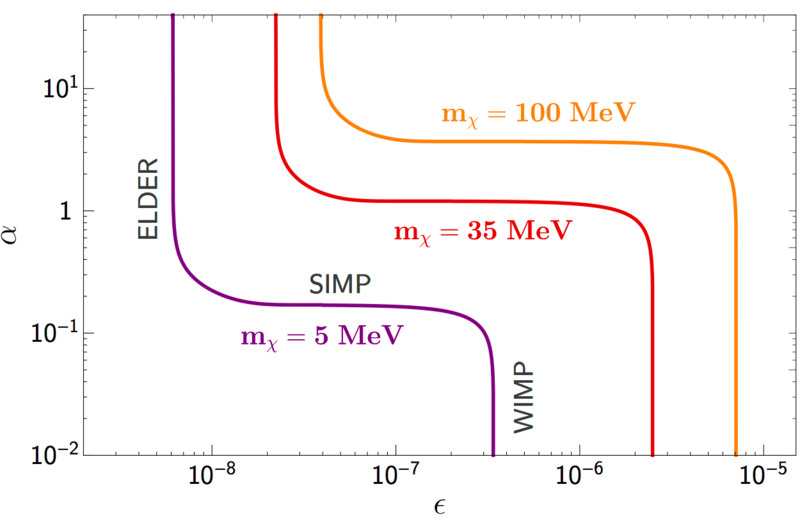 The term ‘weakly-interacting massive particle’ comes from the observation that dark matter of roughly the mass of the weak force particle that interact through the weak nuclear force gives the experimentally measured dark matter density today. 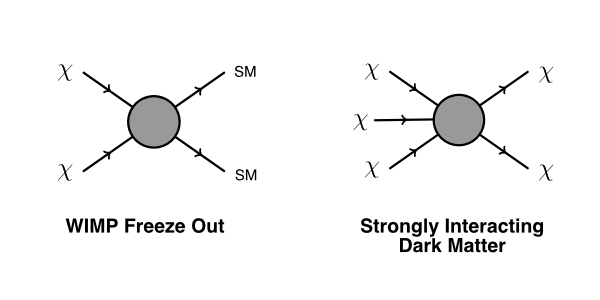 Two ways for a new particle, X, to produce the observed dark matter abundance: (left) WIMP annihilation into Standard Model (SM) particles versus (right) SIMP 3-to-2 interactions that reduce the amount of dark matter. More recently, physicists noticed that dark matter with very large interactions with itself (not ordinary matter), can produce the correct dark matter density in another way. These “strongly interacting massive particle” models reduce regulate the amount of dark matter through 3-to-2 interactions that reduce the total number of dark matter particles rather than annihilation into ordinary matter. The authors of 1512.04545 have proposed an intermediate road that interpolates between these two types of dark matter. The “elastically decoupling dark matter” (ELDER) scenario. ELDERs have both of the above interactions: they can annihilate pairwise into ordinary matter, or sets of three ELDERs can turn into two ELDERS. Thermal history of ELDERs, adapted from 1512.04545. ELDERs are produced in thermal bath immediately after the big bang. Pairs of ELDERS annihilate into ordinary matter. Like WIMPs, they interact weakly with ordinary matter. Assuming that the ELDERs interact strongly amongst themselves, the 3-to-2 number-changing process still occurs. Because this process distributes the energy of 3 ELDERs in the initial state to 2 ELDERs in the final state, the two outgoing ELDERs have more kinetic energy: they’re hotter. This turns out to largely counteract the effect of the expansion of the universe. A “phase diagram” of dark matter models. The vertical axis represents the dark matter self-coupling strength while the horizontal axis represents the coupling to ordinary matter. Wouldn’t the cross-section of the 3-to-2 interaction decrease due to expansion faster than the cross-section of SM freeze-out would? Naively one would think the former requires 3 wimps, so 3 cdm particles would have a harder time to find each other in an expaded universe than 2. Hi Dan, yes: there’s a balancing act. When the universe is hot, it’s not hard for three wimps to find each other since there’s a thermal background of them—that is, they pop in and out of the cosmic soup. As the universe cools below the mass of the wimps, then it indeed becomes very rare for three wimps to find each other.